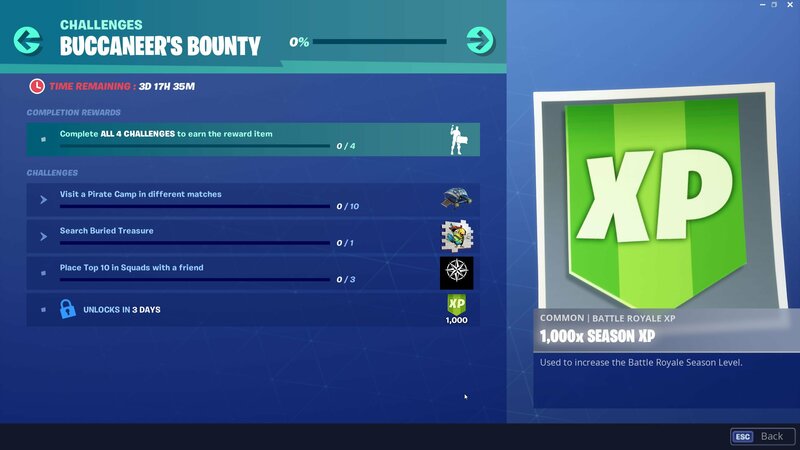 The Buccaneer's Bounty challenges are now live in Fortnite offering up new rewards for dedicated players. Epic Games is always doing new and interesting things in Fortnite, and the latest Buccaneer's Bounty challenges and rewards are but the latest additions. These fresh new digs come as part of the Buccaneer's Bounty Event, which coincides not only with new challenges but new Limited-Time Modes for every day the event is running. Find out more about the Buccaneer's Bounty rewards and challenges in Fortnite below. The Buccaneer's Bounty Event in Fortnite is live with four separate challenges and rewards on offer. Only the first has been revealed so far, and it's quite simple. The others, however, are still unknown: We'll have to wait one, two, and three more days to uncover the second, third, and fourth challenges. Thankfully, like many of the challenges before, completing all five Buccaneer's Bounty challenges before the event ends on Monday, April 15 will offer players a rare reward in the form of the Boobytrapped emote. The first challenge instructs players to visit a Pirate Camp in different matches. To complete this challenge, players will need to visit a Pirate Camp in ten different matches — visiting more than one camp within a single match will not count toward the challenge. Gamers who need help tracking down the camps should check out our guide to all Pirate Camp locations in Fortnite. In exchange for completing this admittedly simple challenge, players will earn the Plunder glider, an uncommon glider offered up as part of the Scallywags set. To complete the second challenge in Fortnite’s Buccaneer’s Bounty, players will need to search buried treasure. Completing this task will require players to find a Treasure Map and then follow the dotted line that it emits to the treasure’s location. Altogether this is another simple challenge, though it might take some time to find a Treasure Map. To increase your chances, check out our previous guide on how to search for buried treasure, where we share some helpful tips to increase your chances at finding a Treasure Map. Ticking this challenge off the list will reward you with the Pirate Parrot Spray. The third part of the Buccaneer's Bounty challenges will involve some skill on the part of players. It requires gamers to place top 10 in Squads with a friend, meaning not only do they have to link up with someone on their friends list, they'll also have to place somewhere in the top 10 at the match's end. For completing this challenges, players will be rewarded with the uncommon nautical star banner. The final challenge of the Buccaneer's Bounty tasks players to shoot yourself out of a Pirate Cannon in different matches in five different matches. To complete this bounty, you'll want to head to some of the Pirate Camp locations as they are the best spots for finding cannons readily available. When you've found a cannon, approach it and climb inside using the prompts on the screen. This will allow you to then shoot yourself out of it. This can be a great way to surprise enemies or even get away from enemies that might be pursuing you. Completing this challenge will reward players with 1,000 XP towards their Battle Pass. 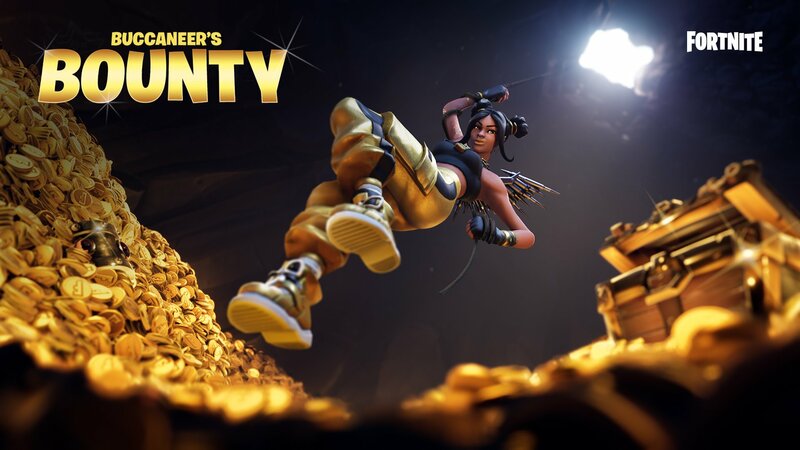 The Buccaneer's Bounty Event as well as its challenges and rewards are another in a long line of timely updates to Fortnite. To stay on top of other fresh news, guides, and videos for Epic Games' hit battle royale title, be sure to stop by Shacknews' Fortnite home page.